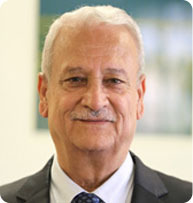 Abdullatif Abuhijleh, Professor of Chemistry, is the 4th President of Birzeit University. He assumed office on 1st August 2015 and was formally inaugurated on 16th September 2015. 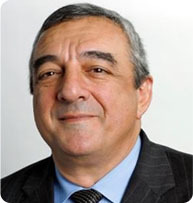 Professor Abuhijleh obtained his Ph.D in inorganic chemistry in 1981 from the University of Mississippi (Ole Miss), Oxford, USA. He has been a faculty member in the Department of Chemistry at Birzeit University since then. 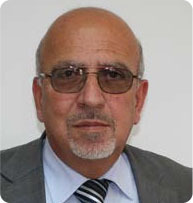 He assumed many leadership positions at Birzeit University including the chair of the Chemistry Department (1984-1986), the dean of Faculty of Science (1995-1998) amongst others. He also served as the Vice President for Academic affairs (1998-2009). During his eleven-year term, he oversaw the university’s expansion into new academic disciplines especially law and public admin, IT, health and development of postgraduate programs. He also maintained an active teaching and research career contributing to the development of academic courses and programs at the Department of Chemistry. Professor Abuhijleh’s research focuses on the synthesis and characterization of copper and other transition metals complexes in biologically active drugs e.g. anti-inflammatory, anticonvulsant, and other biologically important ligands, their physiological role and pharmacological effects and the correlation between their structural properties and their biological activities. He has contributions in excess of 40 articles and presentations published in scientific journals and international fora. Raised in Lutherville, Maryland, just outside of Baltimore, Bishop Graham moved to Lexington, Virginia for his undergraduate education at Washington and Lee University in 1973 where he majored in English. He attended Harvard Divinity School, Cambridge, Massachusetts, where he earned a Master of Divinity. 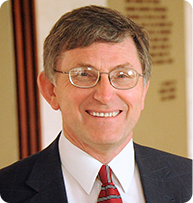 He began studies on a Fulbright scholarship at the University of Strasbourg, France, and holds a Master of Arts degree in Church History from The Catholic University of America, Washington, D.C. 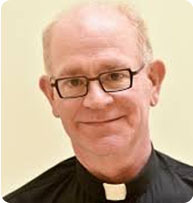 Prior to his current position, Bishop Graham served as pastor of Hope Lutheran Church in College Park, Maryland; assistant pastor of Trinity Lutheran Church in Hagerstown, Maryland; and associate pastor of St. Martin’s Lutheran Church, Annapolis, Maryland. Additional positions of leadership include as elected secretary of the Metro D.C. Synod, member of the synod’s Candidacy Committee, and member of the board of trustees of the National Lutheran Home for the Aged in Rockville, Maryland. Currently, Bishop Graham is a board member of Lutheran Social Services of the National Capital Area. He serves on the ELCA Conference of Bishops Immigration Ready Bench and as the Region 8 Bishop Liaison to the ELCA Church Council. He is also interested in ecumenical work; in October 2014, Bishop Graham received the Holy Land Christian Ecumenical Foundation Award for his contributions, time commitment and support toward understanding and solidarity between Holy Land Christians and Christians elsewhere. Bishop Graham is married to Nancy Ann Graham, and they have two adult daughters and two granddaughters. In his spare time, he enjoys reading, gardening, cooking and hiking. Jad Isaac is the director general of the Applied Research Institute-Jerusalem (ARIJ) which is a leading Palestinian institute that conducts research on agriculture, environment, land use and water. He got his B.Sc. degree from Cairo University and his M.Sc. degree from Rutgers University and his Ph.D. degree from the university of East Anglia in the United Kingdom. He is the former Dean of Science at Bethlehem University. He has published more than 100 articles and books in his field of interest. He headed the Palestinian delegation for the environmental working group in the multilateral talks and is an advisor to the Palestinian Negotiation Affairs Department. He is a member of the Palestinian National Committee for Register of Wall Damages, Palestinian National Committee for ICC, Higher Council for Innovation and Excellence, Scientific Research Council and the editorial board of Water Policy Journal. 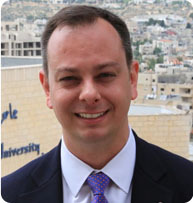 John L. Schlageter is the first and current Executive Director of the Bethlehem University Foundation. Prior to his appointment as Executive Director of Bethlehem University Foundation, he sat as a member of the Board of Directors of the Foundation. John was appointed as the first Executive Director of 11 April 2016 by resolution of the Board of Directors. Before his appointment as Executive Director, John was General Counsel of the Archdiocese for the Military Services, USA 2007-2016. He was appointed General Counsel by then Archbishop Edwin F. O’Brien and continued to serve Archbishop Timothy P. Broglio following his appointment as the 4th Archbishop for the Military Services, USA. John is a double graduate of the Catholic University of America, having received his Bachelor of Arts in History and his Juris Doctor from the CUA Columbus School of Law. John is a member of the Bar Associations of the State of Florida and the District of Columbia. 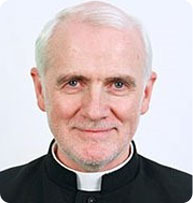 In addition to his duties as Executive Director, John is General Counsel of the Eparchy of Saint Maron of Brooklyn. 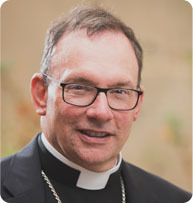 He is a Knight of Columbus and a Knight Commander of the Equestrian Order of the Holy Sepulchre of Jerusalem and is the current President of the Archdiocese of Washington Section of the Order. He is a member of the John Carroll Society, the Federalist Society, and a member of the Board of Directors of the Lasallian Foundation. 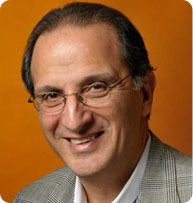 John and his wife Caitlin reside in Washington, D.C.
Dr. James Zogby, Co-Founder and President, Arab American Institute and Member, Executive Committee of the Democratic National Committee. 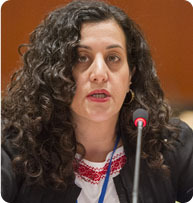 Ms. Feda Abdelhady-Nasser has been the Deputy Permanent Observer from January 2013 to the present. She received the rank of Ambassador shortly thereafter in May 2013. Prior to that, she served as First Counsellor at the Mission as of April 2006. That posting was preceded by appointment as Special Adviser to the Minister of Foreign Affairs of Palestine from March 2005 to April 2006. She also served as Counsellor to the Mission in New York from December 2002 to February 2005, as First Secretary from September 1993 to November 2002, and as Special Assistant to the Ambassador from July 1992 to August 1993. Ambassador Abdelhady-Nasser represents the State of Palestine at the Security Council and at the General Assembly and its Main Committees, particularly the Special Political and Decolonization Committee (4th Committee), with specific focus on the issue of UNRWA and the Palestine refugees, a portfolio she has followed for many years. She is a speech-writer for the Mission and is responsible for the drafting and negotiation of Palestine’s annual package of General Assembly resolutions. She often represents Palestine at meetings of the Arab Group, Non-Aligned Movement (NAM), Organization of Islamic Cooperation (OIC), Group of 77 and China, and the Asia-Pacific Group. Among other responsibilities and initiatives during her tenure at the Mission, she was a member of Palestine’s legal team to the International Court of Justice on the case of the wall in the Occupied Palestinian Territory (December 2003 – July 2004). 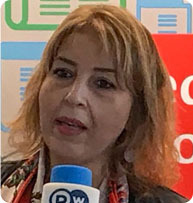 Ambassador Abdelhady-Nasser holds a Masters Degree in Educational Administration (2000) from Rutgers University and Bachelors Degree in Political Science/International Relations from New York University (1992). She is fluent in English and Arabic and conversational in Spanish. She is married and the mother of two sons. 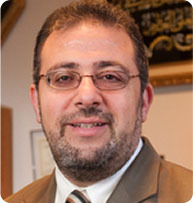 Dr. Sarsar’s commentaries have appeared in many media outlets, including The Star-Ledger; The Daily Beast; Huffington Post; USA Today; Philadelphia Inquirer; Newsweek; The Jordan Times; Daily Star; Miftah.org; Middle East Times; Middle East Eye;Common Ground News; Catholic News Agency; and al-Quds. He has been interviewed and/or quoted by NBC News, Voice of America; The New York Times; and Seattle Times. Dr. Sarsar was featured in The New York Times, “His Mission: Finding Why People Fight—A Witness to Mideast Conflict Turns to Dialogue and Peace.” He is the recipient of the Award of Academic Excellence from the American Task Force on Palestine, the Global Visionary Award and the Stafford Presidential Award of Excellence from Monmouth University, the Humanitarian Awardfrom the National Conference for Community and Justice, and the Holy Land Christian Ecumenical Foundation Award. Dr. Riyad H. Mansour was born to a refugee family that lived in the city of Ramallah in the Occupied West Bank. In 1967, Ambassador Mansour started his college education in the United States. Since his youth, he has always been involved in Palestinian politics and began his career in the Palestinian diplomatic service in 1983 at the Permanent Observer Mission of the Palestine Liberation Organization (PLO) to the United Nations (UN). He was appointed Ambassador and Permanent Observer of Palestine to the UN in 2005 and since 29 November 2012 he has been Ambassador and Permanent Observer to the State of Palestine to the UN. Dr. Mansour is also the non-resident Ambassador of the State of Palestine to Costa Rica and the Dominican Republic. Dr. Mansour joined the Permanent Observer Mission of the PLO to the UN, New York, in 1983 as Deputy Permanent Observer. He represented Palestine in several committees and bodies of the UN. In 1994, he joined the private sector accepting a position as Vice-President for Intram Investments, Inc. Orlando, Florida. There he was responsible for representing the company in governmental relationships, and was key strategist of land acquisition for developmental projects, in addition to other managerial responsibilities. 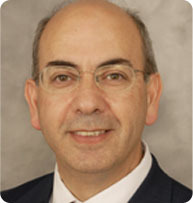 In 2002, Dr. Mansour was also a consultant with Laventhal and Slaughter, P.A. and an adjunct Professor in the Political Science Department at the University of Central Florida. 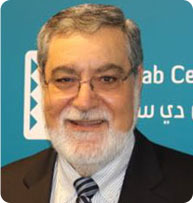 Dr. Mansour, prior to joining the PLO in 1983, began his professional career as a Research Assistant at Youngstown State University, Youngstown, Ohio in 1972. He also held the post of Teaching Assistant at the University of Akron, Akron, Ohio, from 1973 to 1975, where he taught graduate courses in counseling and was responsible for counseling labs. From July 1977 to April 1983, he joined the Permanent Mission of the People’s Democratic Republic of Yemen to the UN in New York, as Research Adviser. At the University of Akron, Akron, Ohio, Dr. Mansour obtained his Doctorate of Philosophy in Counseling in June 1977, with the minor area of concentration in Urban Studies with heavy emphasis on Research Methodologies. In June 1973, he obtained his Master of Science in Education Counseling from Youngstown State University, Youngstown, Ohio. 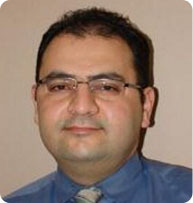 Dr. Mansour is fluent in oral and written Arabic and English. He also has published several studies and articles, particularly about the Palestinian community in the United States of America. He has lectured in many American Universities and has participated in numerous international conferences, symposia, seminars and panel debates as a representative of Palestine. He is also a member of senior officials committees of the State of Palestine and the PLO. Imam Yahya Hendi is the Muslim chaplain at Georgetown University, the first American University to hire a full-time Muslim chaplain, and he just concluded his 15 years of service as a Chaplain at the National Naval Medical Center in Bethesda, MD. Imam Hendi is a Public Policy Conflict Resolution Fellow of the Center for Dispute Resolution of the University of Maryland School of Law and the Maryland Judiciary’s Mediation and Conflict Resolution Office. He is also the founder and the President of Clergy Beyond Borders. He also serves as a member of the Islamic Jurisprudence Council of North America. 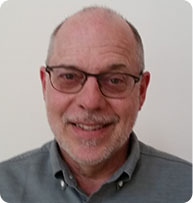 He has served as an adjunct faculty member for Zanvyl Krieger School of Arts and Science and Osher’s Lifelong Learning Institute of John Hopkins University, Fordham University and Hartford Seminary. Imam Hendi also teaches a very popular course at Georgetown University called: Inter-religious Encounter. 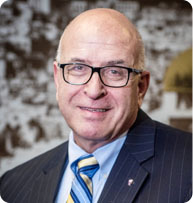 Rateb Y. Rabie, KCHS, the Founder, President & CEO of the Holy Land Christian Ecumenical Foundation (HCEF), was born in Amman, Jordan to Palestinian parents. He came to the United States in 1976 to further pursue his education. From 1981 to 1986, he was Director of Operations for British/Saudi corporation Saudi Support Services, Ltd. He later moved to Jordan, where he worked for his own company, Reem Support Services. In 1989, he moved to Washington, D.C. where he worked for Marriott Corp. and founded, managed and owned several businesses (Image Printing & Publishing, Inc. and Vison Management & Consulting, Inc.) Sir Rabie is co-founder and past national president of the Birzeit Society and co-founder, Vice President and Treasurer of the Institute for Health, Development and Research in Palestine. He is also a Knight Commander of the Equestrian Order of Holy Sepulchre and a 4th Degree Knight of Columbus, founder and co-chair of the Holy Land Outreach Committee of the Knights of Columbus, Maryland State Council. In 1998, he founded the Holy Land Christian Ecumenical Foundation (HCEF), with other Americans and Palestinians concerned about the presence of the Arab and Palestinian Christians in the Holy Land. HCEF is charitable 501(c)(3) faith-based development organization with over 20 programs and offices in Bethlehem and the Washington, DC area. In 2007, The Arab American Anti-Discrimination Committee (ADC) selected Sir Rateb Rabie to receive the Faith and Tolerance Award. This award is given to individuals working with faith-based organizations to encourage cooperation and peacemaking in the Middle East. Sir Rateb is committed to improving living conditions for Palestinians Christians in their homeland, preserving Palestine’s Christian heritage and strengthening the identity of Palestinian Christians in the worldwide diaspora. He pursues this mission under the motto “Let us work together to replace despair with hope, fear with human security and humiliation with dignity”. 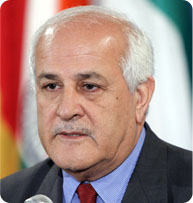 Sir Rateb advocates for peace and justice in Palestine. Sir Rateb is married to his wife of 34 years Rocio, who he met in the United States. Together they have four grown daughters, whom they raised both in the Middle East and in America. They are also the proud grandparents of two young boys and are active longtime parishioners at the Shrine of the St. Jude in Rockville, Maryland. When Dr. Hanania is not practicing Dentistry, he dedicates his time to important causes in his life. For example, Dr. Hanania was a board member of a human rights organization called Imagine-life. He is also a board member of the Holy Land Christians Ecumenical Foundation (HCEF). Currently, Dr. Hanania is the national President of the American Federation of Ramallah, Palestine. 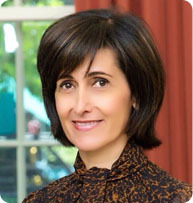 Dina Kawar is a Jordanian diplomat who since June 2016 has served as Ambassador of the Hashemite Kingdom of Jordan to the United States. Prior to her position in New York, Her Excellency Dina Kawar served as the Ambassador of Jordan to France from 2001 to 2013, with concurrent accreditation to the United Nations Educational, Scientific and Cultural Organization (UNESCO) and to the Holy See, since 2002. She also served as Ambassador of Jordan to Portugal from 2005 to 2013. Ambassador Kawar was awarded the Medal of Independence of the first degree by His Majesty King Abdulla II of Jordan and holds a number of decorations including the “Commandeur De La Legion d’ Honneur” from France, the “Medalha de D. Afonso Henriques” from Portugal and the “Insignes de Dame de Grand-Croix de l’Ordre de Saint Grégoire le Grand” from the Holy See. Rabbi Joseph Berman is the Manager of Government Affairs and Grassroots Advocacy for Jewish Voice for Peace. He has worked for justice, equality, and safety for Palestinians and Israelis for over a decade. Joseph grew up outside Kansas City and received his Bachelor of Arts from Wesleyan University in Connecticut. 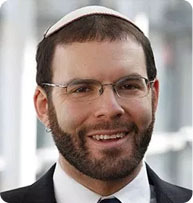 Ordained by the Rabbinical School of Hebrew College in Boston, Joseph has served as a congregational rabbi, a chaplain, and a faith-based community organizer. Fr. John Predmore, S. J.
Fr. John Predmore, S.J. is a board member of HCEF and was formerly the pastor of the English-speaking parish in Amman, Jordan. He led a pilgrimage to the Holy Land in 2017 and works to promote Muslim-Catholic dialogue in Boston and with alumni of the former Baghdad College in Iraq. 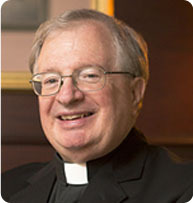 His current Jesuit work provides for the spiritual and pastoral formation of the parents, alumni, and faculty at Boston College High School. Fr. Predmore also provide spiritual retreats incorporating fine art painting and the arts.